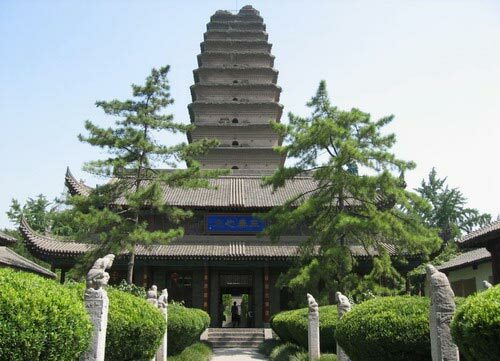 The pagoda is located south of Youyi Road in Xi'an, Shaanxi Province, in what used to be Jianfu Temple in Anrenfang of Tang Dynasty Chang'an, outside the southern gate of Ming Dynasty Chang'an. Along with the Big Wild Goose Pagoda it was an important landmark in Chang'an, capital of the Tang Dynasty. Since it was smaller and built later than the Big Wild Goose Pagoda, it was named the Small Wild Goose Pagoda. It was built in 707 during the Tang Dynasty. Small Wild Goose Pagoda (小雁塔) is a multi-eave, square, brick structure consisting of fifteen stories. Originally it was 46 meters high, but now it is 43.3 meters high, because its steeple was destroyed. It has a square pedestal and a huge first story, whose sides measure 11.38 meters long. Carved on the lintel are images of arhats, their excellent workmanship reflecting the artistic style of the early Tang Dynasty. The shape and structure of the pagoda are typical of early multi-eave pagodas and influenced many brick and stone multi-eave pagodas built later in other parts of the country.